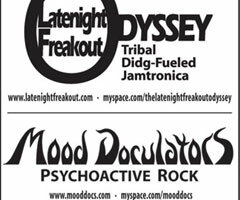 An exciting evening, teamed-up with our friends from across town: Latenight Freakout Odyssey. This special event featured us with a pro light rig for the first time (complete with occasional fog bursts). Our set contained a number of instrumental tunes, including a spacey "Rubber Dub", and a rare take of "The Hustle". The Latenight crew then came on to carry things into the AM with their unique thump and groove.